Canada needs to be more competitive if it is to become a leading manufacturing nation front and centre on the world stage. While we have manufacturing firms with growth rates above 15%, overall the sector is stagnant. With the right technologies in place—robotics, additive manufacturing and big data analytics—Canadian manufacturers can spur innovation and transform the efficiency of their operations. We have developed a roadmap to achieve this vision by creating a stronger investment-friendly framework, shifting Canada’s manufacturing culture to accelerate technology adoption, and growing an inclusive and digitally skilled workforce. We are Canadian innovators, driven by imagination and inclusion, committed to creating a better world through the things we make #MadeBETTERinCANADA. Manufacturing continues to be a large component of the diversified Canadian economy. We have a proud tradition of transforming our country’s natural resources into goods that are integrated into the global supply chain. While some nations close their borders, we have opened ours up to the world: this openness has always been an economic strength. But now, to continue to prosper, we need to grow a more diversified export market by developing new products and by adopting technology that will make us more productive. When we do this, we will create good jobs for Canadian ‘makers’ and "make the world more Canadian" by exporting our liberal and open values through the products we build. Advanced manufacturing in Canada is innovative, fair and sustainable. The world needs more of it! This line graph illustrates manufacturing sales projections for Canada. The horizontal axis indicates the year and goes from 2004 to 2031 in increments of three. The vertical axis indicates dollars in millions and goes from 200,000 to 1,200,000 in increments of 200,000. A red line represents sales. That line goes from about 600,000 in 2004, drops sharply between 2007 and 2010 to about 500,000, and steadily climbs to above 600,000 in 2018. Three more lines split off from the end of the red line. A yellow line represents growth over the last five years. It rises sharply from around 600,000 in 2018 to above 800,000 in 2031. A black line represents growth over the last 10 years. It rises slightly from around 600,000 in 2018 to around 700,000 in 2031. 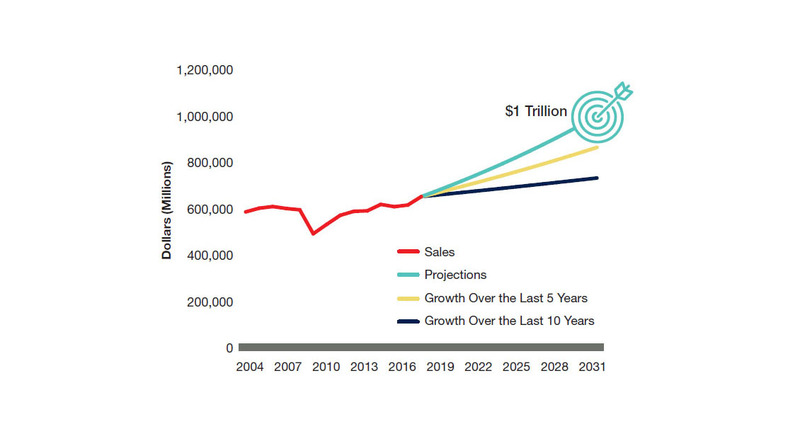 A turquoise line represents projections and rises sharply up from around 600,000 to a target/bullseye icon indicating $1 trillion. This line graph illustrates manufacturing export projections for Canada. The horizontal axis indicates the year and goes from 2005 to 2031 in increments of three. The vertical axis indicates dollars in millions and ranges from 100,000 to 600,000 in increments of 100,000. 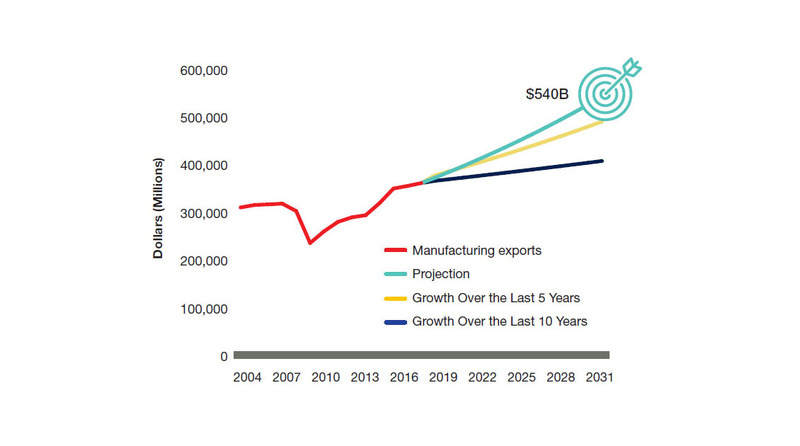 A red line represents manufacturing exports. It starts at just slightly above 300,000 in 2004, drops sharply between 2007 and 2010, and climbs steadily up to around just under 400,000 in 2018. Three lines extend out from the end of the red line. A yellow line represents growth over the last five years and rises sharply from just under 400,000 in 2018 to around 500,000. A blue line represents growth over the last 10 years and rises slightly from just under 400,000 in 2018 to about 400,000 in 2031. A turquoise line rises sharply from just under 400,000 in 2018 to a target/bullseye icon indicating $540 billion. To track the well-being of the Canadian manufacturing sector, we chose targets that reflect manufacturing sales and exports. Growing the manufacturing sector requires Canada to diversify its export markets and offerings, since the national market is comparatively small. In other words, the success of the manufacturing sector is shaped by Canada’s relationship with the world. A sales target complements this because it reflects the health of Canadian firms and the extent to which they are growing in general. A 3.2% growth target for annual sales and exports is ambitious but achievable. We need a continuous feedback loop in this country that lets us track our competitiveness compared to other jurisdictions and ensure we continue to create value for our customers. Growth is slow in the main export market of the U.S.
Canadian manufacturers will either adopt technology or die. So let’s assume they’ll adopt. And let’s help them adopt Canadian innovations—so the next SAP is a Canadian AI firm. Why not? Canada has to assume a leadership role in the world again. That starts here at home with industry members working together and with all levels of government. First steps have been taken through the new supercluster initiative, which provides a national platform to launch disruptive projects. We propose a network of technology adoption centres to accelerate this kind of cooperation and build momentum around bringing manufacturers together to work on common goals. We also propose measures to make it more attractive for global firms to invest in Canada—whether they are headquartered here or not. This will allow us to leverage global value chains. As well, we offer proposals for giving Canadians the skills to become makers and the support to become entrepreneurs—and for the country to benefit from these disruptions. The target should be that established manufacturers are choosing to keep more mandates in Canada. Because that drives the whole supply chain. And to do that, Canadian manufacturing needs to be both productive and competitive. Canadian manufacturers are ready to do their part. Through the Economic Strategy Table initiative and as a sector as a whole, we’re committed to creating better jobs with higher wages for Canadians and a better quality of life for all of us. We want to build a strong economy that will resist global economic fluctuations. On the left side of this rectangular graphic is a grey column. Inside the grey column is vertical text that reads "#MadeBETTERinCANADA." On the right side of the graphic is a circle divided into four sections. At the centre of the circle is the logo for Canada’s Economic Strategy Tables. Going clockwise, the top-most section of the circle is blue, is labelled "Capital" and includes an icon of two gears, one of which has a dollar sign at its centre. The next section, yellow, is labelled "Talent" and includes an icon of a person wearing a graduation cap. The next section, light green, is labeled "Productivity" and includes an icon of a robotic arm. The final section, green, is labeled "Market" and includes an icon of a wireframe globe. Between the grey column and the circle are four numbers with colours that correspond to the different sections of the circle graphic. "1" is blue and is labelled "CANEXPAND". "2" is yellow and is labelled "Skills and Talent Initiative." "3" is light-green and is labelled "CANADVANCE". "$" is green and is labelled "Hypergrowth Initiative." Three to five bullets fall under each number. Canadian manufacturers are determined to achieve these goals. This requires ambitious commitments by our industry as well as all levels of government and academia. We are calling for a National Manufacturing Strategy to move the sector forward: significantly increasing the use of productivity tools and upgrading our baseline competitiveness through better access to capital, talent and the market. This Strategy will provide a continuous improvement framework to accelerate manufacturers’ growth cycles and ensure we invest where it works and divest where it doesn’t. At the same time, we need a continuous process reporting back on the progress of our actions regularly, applying business-led metrics. We propose CANEXPAND as a multifaceted, systematic program to attract investment from domestic and global anchor firms and strengthen Canada’s manufacturing ecosystem. It would give businesses a single window for communication with all levels of government, as well as domestic and foreign clients, to speed up permits and regulatory approvals, provide incentives and access to a network of technology centres and ultimately help build and promote an attractive value proposition for Canada. Who are some of our competitors? This online database of shovel-ready sites that have undergone comprehensive review features an interactive map that lets users layer on information like heat maps showing demographics, consumer spending and broadband coverage. It is operated by JobsOhio, a non-profit organization designed to drive job creation and new capital investment in Ohio through business attraction, retention and expansion efforts. This federal agency coordinates strategies to strengthen Mexico’s participation in the international economy and oversees activities to attract foreign investment. Its website features a site selection tool and cluster mapping of key industries. "Corporate mandate" is the business term describing when a multinational corporation chooses to design, develop and/or manufacture specific products in a particular country, making that country’s suppliers part of its global supply chain. The growth of Canada’s manufacturing sector hinges to no small degree on its ability to attract these kinds of mandates. Countries compete globally to attract these mandates, and Canada needs to do more to bring them here. Today, our regulatory environment is complex; permit times are slow; labour and energy costs are higher than in some other jurisdictions; and we are not as competitive as we used to be on taxation due to recent U.S. changes to corporate tax and capital cost allowances. It is important for this to be rebalanced. Canada not only has to match other jurisdictions with respect to regulatory and policy competitiveness, but it must surpass them and become a global leader. Most importantly, firms have a short time window for making decisions. With federal, provincial and municipal governments all involved in approvals, Canada does not react quickly enough. As a result, foreign and domestic firms are choosing to design and make their product lines elsewhere. Coordination between all levels of government and industry is therefore essential. While growing domestic firms is crucial, Canada also needs to be more proactive in attracting foreign direct investments (FDI) into our country. 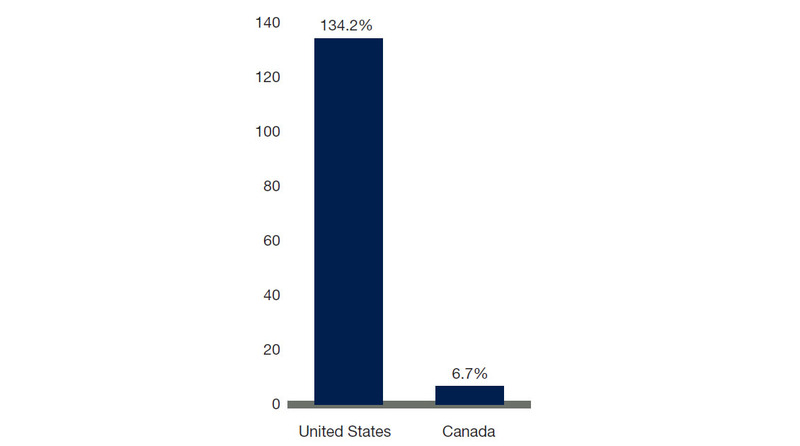 From 2009 to 2014, foreign investments in Canada grew less than 7%—compared to 134% in the U.S. Since 2012, our country has accounted for 1.3% of global Greenfield foreign direct investment capital spending on manufacturing-related activities and approximately 1.5% of global value-added manufacturing. A bar graph illustrates growth in manufacturing foreign direct investment by country from 2009 to 2014. There are two bars on the horizontal axis, one labeled United States and the other Canada. The vertical axis goes from 0 to 140 in increments of 20. United States is at 134.2%. Canada is at 6.7%. secure financing and become more innovative. As of March 2017, it had granted $421.9 million in funding to manufacturing firms. This investment attraction organization works as a single point of contact to help investors navigate the various levels of government while provide site selection analysis. This new Ontario service provides a one-stop-shop for business information and tailored investment solutions. Its goal is to improve the investor experience by providing high-quality, timely and tailored insight and intelligence on business and market opportunities, incentives, talent, and business immigration. The goal of the Hub is to provide seamless, single-window client support to high-impact investors. It will have investment-attraction professionals responsible for marketing, outreach, business intelligence, research and investment aftercare. In 2016, FDI flows into Canada were down by 50% compared to the pre-recession average in 2005–2007. Meanwhile, global investment flows were up by 20% and investment in the U.S. increased by more than 110%. Canada needs to do a better job of coordinating across three levels of government and tailoring its pitch to the opportunities available. Recent initiatives try to address this but there are still gaps at the national level. Improvements are required to create jobs, add revenue to our tax base that supports social programs, and anchor supply chains that exert positive ripple effects throughout the economy. CANEXPAND would provide the one-stop shop needed to simplify the process and take advantage of opportunities. Canada Advanced Manufacturing Concierge Service (CAMCS) and CANBUILD: This network of one-stop portals across Canada will give industry executives a single interface for exploring advanced manufacturing expansion in Canada. CAMCS will receive advanced manufacturing expansion requests and rapidly link federal, provincial and municipal governments to have a focused conversation with the requesting corporation. CAMCS would establish and maintain a database of shovelready advanced manufacturing sites across Canada in collaboration with municipalities and provinces. These CANBUILD sites would be included in CAMCS Quick Commit response packages. CANFUND Advanced Manufacturing Incentive Funds: CANFUND will be a key tool for CAMCS. CAMCS officers who know the federal and provincial funding sources available to advanced manufacturing firms would pull together a logical incentive package in response to a Quick Commit application and support firms in obtaining the funds outlined in a Letter of Intent. Incentives should include taxation measures, including an immediate 100% capital cost allowance over a period of five years and a $1 billion repayable loans fund, to draw firms to Canada. Quick commit system:Firms using CAMCS to request support for establishing, retaining, reinvesting or expanding an advanced manufacturing capability in Canada would be encouraged to complete a QUICK COMMIT application outlining their business plan and type of support they are seeking. The application could also include an MOU to allow data sharing and address privacy concerns. Canada competes Team:This small team in CAMCS would provide ongoing feedback between industrial performers and federal and provincial economic and trade policy development officials. The team would maintain dashboards to track Canada’s global competitive position on cost of manufacturing, taxation, regulation and exporting. Additionally, the team would be responsible for transferring export opportunity knowledge to SMEs. An industry and trade commissionaire interchange will be piloted to facilitate first-hand learning on global export markets. The team could also work on a re-branding effort of the development of national standards for minimum Canadian content and quality that would reflect current global supply chain realities while allowing something to be officially tagged "Manufactured in Canada".
" As an entrepreneur in the manufacturing sector, and with 100% of products being exported, there are many barriers that I have to face as an intensive R&D firm. The main challenge within the ecosystem for a small or medium enterprise is finding homegrown support and being able to market our products in Canada. The majority of our customers are abroad due to the risk-adverse funding environment in Canada, which consistently leaves the firm seeking capital. Furthermore, when the firm’s products are being exported, we’re constantly required to ‘reinvent the wheel’ to fulfill the various funding program requirements for eligibility. The CANEXPAND program could provide support for entrepreneurs to grow in Canada and further the firm’s opportunities as an exporter." We are doing leading-edge work in Canada; we are just not good at telling the world what we’ve got. I’d love us to be recognized as a global centre of excellence for advanced manufacturing. This multifaceted and nationally coordinated approach to increase our talent advantage, attract new talent, grow work-integrated learning efforts, re-skill the manufacturing workforce and increase the number of underrepresented groups in the sector would have a skills collaboration network at its foundation. A main focus of the initiative would be to support lifelong training and skills development, starting with early exposure to advanced manufacturing and continuing with job grants, curriculum development and mentorship. To achieve this goal, strong cooperation between all levels of government, academia and industry will be essential. Adopting advanced manufacturing technologies requires new technical, process-related and business skills. Access to skilled talent is also an important consideration for companies when assessing where to expand and invest in manufacturing capacity. Of manufacturers surveyed, 32% indicated that access to skilled labour is a critical qualification in selecting locations for global mandates. Yet the fast pace of technological change and the aging of Canada’s workforce are creating a scarcity of skilled and experienced manufacturing workers. That deficit is projected to grow over the next 10 years: today there are 30,000 jobs waiting to be filled in the manufacturing sector. By 2026, an additional 55,600 workers will be needed, according to the Canadian Occupational Projection System. This represents an unprecedented opportunity for manufacturers to access untapped potential in the workforce, particularly among underrepresented groups. For example, women account for almost half of the Canadian workforce, yet they continue to be under-represented in skilled trades and technical professions including science, technology, engineering and mathematics. Manufacturing competes with other sectors for the same skilled workers, especially technicians, technologists and those in the trades. Prospective workers may be more attracted to other industries—such as construction, utilities, oil and gas and professional services—as they may offer, or be perceived to offer, better incentives than manufacturers. To get more Canadians interested and skilled in advanced manufacturing, the sector first needs to be clear about the roles available and skills required. The U.S. Digital Manufacturing and Design Innovation Institute has already partnered with ManpowerGroup to develop a comprehensive taxonomy of emerging roles and skills in the digital manufacturing and design space. In Canada, Budget 2017 committed $225 million over four years—and $75 million a year afterward—to the Future Skills initiative, which will establish a new organization to identify the skills employers require. 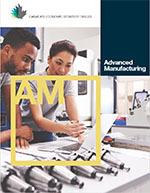 Creating a comprehensive taxonomy of emerging roles and skills in the digital manufacturing and design space for Canada will allow us to grow the supply of work-ready entrants to the manufacturing sector, create high quality employment opportunities for youth and connect firms with the next generation of skilled talent. Canada has a global advantage with its knowledge-based workforce and certified skilled trades, and business is able to get immigration approval to relocate key international staff to Canada. However, Canada needs the ability to rapidly identify specific relevant strengths in Canadian talent and map them against specific investment opportunity requirements. Made up of leaders from the private sector, universities, colleges and polytechnics, the Roundtable works to help young Canadians transition from education to the workplace, strengthen research collaboration between industry and institutions, and help Canadian employers as they adapt to the economy of the future. This organization’s reskilling grants, supported by FedDev Ontario, are an example of a program that has had a transformative regional effect in confronting skill and technical knowledge gaps for workers on the job. The Canadian Advanced Manufacturing Skills and Talent Pathways Initiative The Canadian Advanced Manufacturing Skills and Talent Pathways Initiative would establish a skills collaboration network to tie business, universities, colleges, polytechnics and other educational providers together. It would identify skills gaps aligned with labour market information as well as resources available to manufacturing companies. The network would support ongoing cooperation between industry and educators on curriculum design—particularly as it relates to skilled trades, which is a strength of countries like Germany, France and the UK. 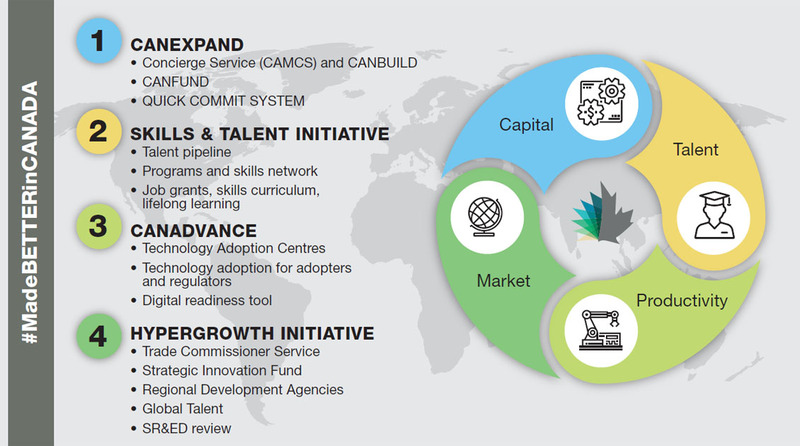 A talent pipeline: Established by exposing Canadians to advanced manufacturing through public visits to facilities, giving Grade 3 students the chance to see and explore transformative technologies, increasing funding and support for STEM early learning programs, and creating a national foreign manufacturing student scholarship pilot program for foreign workers in Canada after accreditation. Successful projects from around the globe include Girls Day, an annual event that gives young girls exposure to manufacturing processes and possible manufacturing careers. Work-integrated learning: This would amplify workintegrated learning (WIL) through partnerships between current programs and established organizations such as national business associations. It would support a database of opportunities, better SME access to talent and better understanding of needs. The Siemens Canada Engineering and Technology Academy program is one established model for the advanced manufacturing sector. A skills collaboration network would set a target for the number of WIL programs. Additional incentives for underrepresented groups like women, Indigenous, persons with disabilities and visible minorities would also be piloted. Job grants, skills curriculum: Continuing the Jobs Grants Program and establishing a national manufacturing skills curriculum, digitally accessible everywhere in Canada, using the industry-government partnership model to accelerate retraining of the existing labour force. Lifelong learning: Given the importance of re-skilling, we recommend a national pilot program aimed at lifelong learning under which applicants would be given a fixed amount of funds, possibly matched by industry, and could choose where to be trained. Adopt and recognize a standards-based, nationally portable, industry-recognized skills certification system so employees know their certification and credentials will be recognized by employers anywhere in Canada (e.g., Canada’s certWORK program). Attract and retain talent by recognizing the certification of foreign students and by providing scholarships with a commitment to work for a certain period of time in the industry in Canada. Retain foreign students graduating from Canadian universities and colleges by providing work permits and accelerating the Canadian citizenship process. Establish a national advanced manufacturing mentorship network to pair advanced manufacturing start-up executives with experienced manufacturing leaders. This needs to include a women-in-manufacturing network to encourage growth of women-led businesses. Promote and re-brand the image of Canadian advanced manufacturing through a national branding and role model campaign (#MadeBETTERinCANADA) that targets women, youth, university students and foreign investors. This would involve government, industry and associations partnering to fund and facilitate the campaign and meeting young people where they are to promote the importance of the sector nationally and market the great jobs available to them. Lower the perceived risk of adopting new technology by creating CANADVANCE, Canadian advanced manufacturing technology adoption centres. A not-for-profit would be at the centre of the network, supported by public and private partners and building synergies with and complementing the emerging work of key Canadian superclusters. The rise of data-driven Industry 4.0 will create a new global environment where early adopters are rewarded for their readiness to adopt new technologies while those who avoid change get left behind. Virtually every facet of modern manufacturing will be transformed—from how products are researched, designed, fabricated, distributed and consumed to how manufacturing supply chains integrate and factory floors operate. IoT (Internet of Things) applications in manufacturing and factory settings will generate $1.2–$3.7 trillion of global economic value annually by 2025. Industry 4.0 technologies have the ability to boost the productivity of the world’s factories by 10–25%, adding 1–1.5% to a nation’s annual productivity growth. Businesses in Canada that have adopted new technologies often have higher growth and productivity and lower operating costs. For instance, digital manufacturing reduces operating costs by lowering maintenance expenses between 10–40% and makes firms more responsive, reducing time to market costs 20–50%. Yet on the whole, Canadian manufacturers are slower to adopt advanced manufacturing technologies than their international competitors. If we can double the efficiency of our manufacturing workforce in next 10 years, by investing in technology that increases their productivity, would that be enough to make the investment decision easy? YES"
This Canadian non-profit with centres across the country allows small and medium enterprises (SMEs) to serve and train each other in various areas of manufacturing, including lean manufacturing. It adopts Industry 4.0 technologies and provides a digital readiness assessment tool, which complements its lean assessment. In the U.S., the DMDII encourages factories across America to deploy digital manufacturing and design technologies to be more efficient and cost competitive. Its initial federal funding of US$70 million has been matched 2:1 by companies, universities, and state and regional governments. This German organization illustrates the opportunities that digitalization can create for SMEs and how to implement technologies successfully. It uses well-explained, neutral and practical information to provide specialized support in designing and implementing a digitalization strategy. They invest less in technology than U.S. peers, except in a few specific sectors such as chemical manufacturing. CANADVANCE would be a national network of specialized centres advancing Industry 4.0, digitalization, and the latest manufacturing technologies and materials. It could "pull" on existing federal, provincial, academic and private institutions to build a quality, integrated and cooperative network of small regional centres in the key manufacturing areas of Canada, involving existing not-for-profits or new ones that bring together industry, associations, universities, polytechnics, colleges and the relevant facilities of National Research Council. A hub for #MadeBETTERinCANADA The centres would also play a prominent role as physical hubs for the #MadeBETTERinCANADA campaign, funded by the proposed CANEXPAND initiatives. A Digital technology readiness tool The centres could also serve as the hubs for the digital readiness assessment and adoption tool. Drawing lessons from past programs like the National Research Council’s Digital Technology Adoption Pilot Program, this tool would allow companies to develop digital skills and culture and it would offer coaching on how to lead digital transformations and provide practical support with adoption. Meet, coordinate, cooperate This approach follows the German Fraunhofer model, but adapts it to the already strong Canadian R&D context. The centres would be a place for all stakeholders (federal/provincial/municipal governments, academia and industry) to meet, coordinate and cooperate. They would provide technology demonstration, contract work, and Industry 4.0 readiness assessment certification. Early adopters would have the opportunity to train their managers and teams in digital skills needed to roll out new technology across the whole production line. Since mature technologies need centres that test beyond the proof-of-concept stage to try production at higher rates of scale, the network could also host physical and regulatory sandboxes and introduce frameworks that allow businesses to test products and business models in emerging fields (e.g., drones, self-driving vehicles) without having the immediate imposition of regulatory requirements. Implement and fund The Advanced Manufacturing Economic Strategy Table could form the nucleus of a board of directors that would oversee the design and implementation of the new not-for-profit. The federal government could provide 40% annually of the funding of each centre through periodic competitive processes, with the balance of revenue coming from industry memberships, project contracts, and awards from existing federal and provincial funding programs. This would create stability, while ensuring the centres are focused on their clients’ needs. In addition, existing funding programs, such as the Strategic Innovation Fund (SIF) and IRAP-NRC, could dedicate a portion of the available funds to CANADVANCE projects. This proposal will allow Canada to generate more anchor firms by consolidating and focusing existing government and private-sector support on mid-sized manufacturing companies that demonstrate the highest potential. These firms would be able to access an accelerated growth service and would have more streamlined and integrated access to existing government programs. Hyper-growth would also be facilitated by several funding and service mechanisms. High-growth enterprises—those with an annual growth of 20% or higher—represent 5% of Canadian companies, and yet they account for 45% of new jobs. On the other hand, large firms (with more than 250-500 employees) tend to perform best in terms of productivity, innovation and exports. By leveraging high-growth SMEs to expand the number of large Canadian firms, we stand to grow our competitiveness as well. In the Canadian manufacturing sector, a firm is deemed to have high potential for scale-up if it is in the top quartile of manufacturing revenue and productivity growth for five consecutive years. In 2012, there were 830 high-growth Canadian manufacturing SMEs. Between 2010 and 2013, these SMEs contributed to 4.4% of Canadian employment and accounted for 11% of economic revenue. Growing successfully in Canada means that manufacturing firms need to quickly penetrate export markets and integrate into established supply chains, while finding the talent and capital they need. Our experience tells us that government support can be hugely valuable at this stage, but it needs to be easy to access—because entrepreneurs are time-crunched by growing their business—and personalized. Canada has built a strong reputation for its support to start-ups, but our Table has identified specific opportunities to do better at supporting the next stage of development. Canadian manufacturing firms need three things to grow: capital, revenue, and talent. The "Own the Podium" approach advocates consolidating our support behind potential winners. Based on business- led metrics, we would identify a small cadre of hyper-growth firms and focus existing government and private-sector scale-up support to accelerate them with the goal of creating a set of new Canadian anchor firms. The firms targeted would be those with market leadership, sufficient scale, and capacity—able to draw on existing resources to facilitate cooperation and support projects that contribute lasting economic benefits. They might be firms that are members of our new supercluster, which is expected to increase economic revenue by $13.5 billion and create 13,500 jobs. Firms need risk capital for growth and expansion projects that can be leveraged by other investors to de-risk their own investments. The federal government has the opportunity to address the supply gap in the Canadian venture capital market by acting as a "sidecar" co-investor whose support can be "unlocked" when two large Canadian firms invest in a Canadian manufacturing scale-up. The Table strongly believes this is an opportunity to encourage large Canadian manufacturing firms to invest in the future of our strategically important sectors and grow stronger manufacturing clusters, to the collective benefit. International examples (ERP-EIF Co-investment Growth Facility and UK Innovation Investment Fund) demonstrate the positive influence these policies can have on encouraging growth and addressing failures in the capital market. Firms need first customers to unlock client confidence and build strong revenue streams. CANADVANCE will help this. Government procurement at all levels is needed to support the growth of Canadian SMEs and improve Canada’s 55th-place ranking for government procurement of advanced technology products. We need to be a top-10 country. To support this proposal, we endorse the Innovative Solutions Canada model that sees government issue public challenges to achieve novel outcomes—and serves as the first customer of the selected innovator. We strongly believe there is an opportunity to re-focus existing procurement structures and evaluations to support the growth of domestic capabilities and sectoral strengths, and to promote the success of women and Indigenous-led firms. We call on the Government of Canada to expand the use of innovative approaches, and to share best practices with other levels of government. We support the federal government commitment in Budget 2018 to increase funds to the four federal business-facing innovation platforms over time: the National Research Council’s Industrial Research Assistance Program, the Strategic Innovation Fund, the Canadian Trade Commissioner Service, and the Regional Development Agencies. Doing so will help increase business R&D, commercialization, technology adoption, scale-up, export growth and skills development for economic growth. We also have specific advice on how these programs could be made even stronger. All of these mechanisms can be made more effective by rallying the services into a one-stop shop for high-growth potential firms, with simplified access. Currently information is diffuse, so uptake is patchy and inefficient. We recommend making the TCS performance-based (by giving it export growth targets), training SMEs on exporting, embedding trade commissioners in anchor firms, and piloting an industry/ trade commissioner interchange program so companies can gain first-hand experience and knowledge in global export markets. The new consolidated Strategic Innovation Fund is a valuable program that is helping many strong proposals to get support. However, its current levels of funding are not sufficient to meet the potential of the program to unlock growth. We call for a recapitalization of the Strategic Innovation Fund and support for regional development programs focused on advanced manufacturing. We call on the Government of Canada to develop a Global Talent Strategy, similar to that of the Forum of International Trade Training (FITT) for export-oriented C-suite talent, which maps Canadian talent strengths and gaps as a means to better inform future training programs and talent searches. Additionally, we call on the government to make the Global Skills Strategy permanent. To encourage firm scale-up, the Scientific Research and Experimental Development (SR&ED) program needs to be reviewed. Currently, Canadian-controlled private companies generally receive an annual refund of up to 35% of the first $3 million in eligible expenditures. Beyond a slow application process, these parameters are out of step with the kind of research in today’s digital era. In addition, there is need for a review that further addresses the scale-up gap resulting from the natural progression of a growing firm. While the SR&ED program successfully supports R&D activities in Canada, production is then often shifted to other countries. New and existing programs should aim to retain these firms’ production in Canada by creating additional incentives to do so. Canada’s economy is becoming digital, and Canadian manufacturing plays a key role in this transformation. Our proposals have ambitious goals and call for leadership and coordination of all stakeholders: federal, provincial and municipal governments, academia, and industry. We cannot do it alone. Now is the time for Canada to take the lead and achieve goals that matter to us. By working together and building on existing initiatives, such as the superclusters initiative and the Strategic Innovation Fund, we can build better products, infrastructure and healthcare solutions while becoming more economically diverse and sustainable. At the same time, we can create better jobs for an inclusive and highly digitally skilled workforce, improving quality of life for all Canadians by building skills in digitization, robotics, additive manufacturing and others. This commitment needs investments from all of us, and it is how Canada will continue to be a role model to the world. Canadian manufacturers are ready to do their part with the proposed initiatives, and by continuing to be innovative, fair and sustainable. Raise foreign direct investment (FDI) growth to 100% Canada currently has a 7% FDI growth rate ( U.S.: 134% FDI growth). Canada ranks in the top 15 among OECD countries on the World Bank Doing Business Right Index in average time to get project approval Canada is currently ranked 34 out of 35 countries (compared to the U.S. in fourth, the U.K. in sixth and Norway in 12th). Fill 60,000 advanced manufacturing jobs within the next 10 years Canada has to fill a gap of 60,000 manufacturing jobs within the next 10 years. Add 24,000 jobs for women in manufacturing in the next three years In order to fill the expected gap, underrepresented groups have to be tapped. Reduce Canada’s information and communications technology (ICT) investment gap with the U.S. by 20% to 30% The current gap to the US for ICT investments is 40%. Increase the percentage of manufacturing SMEs adopting Industry 4.0 from 39% to at least 75% Manufacturers in Canada are still hesitant to adopt Industry 4.0. Become a top-10 country for government procurement of advanced technology products Canada is currently ranked 55th. Grow at least 25 SMEs into large companies (500 or more employees) or anchor firms Canadian SMEs often need help with the last step of hypergrowth into an anchor firm.